There's really only a handful of fashion items that I have a visceral reaction to when I see them in-store or online. Things like chunky knits, corduroy, and, yes, plaid pants seem to just ignite all the fall feelings in my soul. In other words, these are the pieces that define my fall mood year after year. Maybe it's because I've finally sunk my teeth into the current season, but lately I've been craving the perfect pair of plaid pants to add into the rotation. You might be thinking that the pants are just another "boring" style staple to have on hand, but you'd be very, very wrong. This season especially, designers are answering all my plaid pant prayers and rethinking them in completely new ways. Whether they're a skirt-pant hybrid like Sandy Liang's cool pair or reimagined in bright pink à la Collina Strada, this season's offerings are nothing if not a fresh take on the seasonal staple. Naturally, I went ahead and scoured the internet in search of the coolest styles among them. After comparing hundreds of plaid pants, I ended up adding the following 16 styles to my cart—you know, for safe keeping. If you also share my big fall mood for plaid pants right now, I suggest you continue on to shop my all-time favorite styles and get inspired by a few styling ideas for them. Add some polish with a matching check blazer. Nail two trends in one go: plaid and cargo pants. The hardware on this pair is just too good. No one does plaid trousers quite like Acne Studios. Here's how to nail print clashing like a fashion girl. I never knew I needed a skirt-pant hybrid until I saw these. Tuck in a solid-colored turtleneck to let these really stand out. 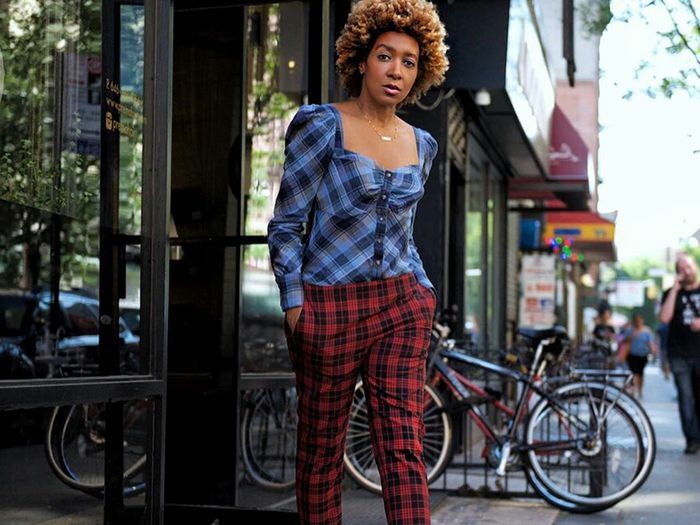 Don't overthink it: A button-down shirt and ankle boots are the easiest way to style plaid pants. If someone says plaid pants are boring, just show them these. All the cozy fall feels. Fun fact: This pair comes with a matching bomber jacket, which I highly recommend. I'm really into these bold checks. I added these to my cart in seconds flat. An oversize blazer and dad sneakers are the coolest way to style the pants this fall. Style them with your basics for an easy fall 'fit. Yep, I just ordered these. I can only imagine how comfy these are. Maximalists, this should be your next look. Made to be worn with your favorite sweaters. Now you have 16 different ways to nail the trend.